On a daily basis, I wear eye liner, but usually I use either a gel liner or a pencil eye liner. But I’ve been curious about trying out a liquid eye liner because unlike gel liner, I don’t need to use a separate brush. And, unlike a pencil eye liner, liquid eye liner is supposed to be more long-lasting and smudge-proof. The new Milani Ultrafine Liquid Eye Liner in Black Vinyl was the first liquid eye liner I’ve ever tried, and I was excited to put it to the test! I was concerned about not being able to draw a straight line. Gel and pencil liners are more forgiving because you can go over the same area and fill in parts you missed. But, going into this, I thought that liquid liner was trickier. More on my surprising experience with that in this post! This entry was posted in Makeup Reviews, Product Reviews and tagged Milani on March 11, 2013 by Mary S.. Since then, I’ve been itching to try out more red lipsticks because I love how they ‘wake up’ your complexion and can look classy. Well, Milani came to the rescue like a beauty caped crusader! I’ve been test-driving one of the new Color Statement Lipsticks by Milani – the Milani Cherry Crave Color Statement Lipstick to be exact! 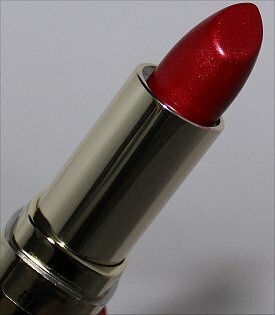 It’s very different from MAC Ronnie Red in terms of colour and finish, but I’ve found this to be an easy-to-wear red lipstick for my skin tone as well! YAY! This entry was posted in Makeup Reviews, Product Reviews and tagged Milani on February 26, 2013 by Mary S..
Valentine’s Day may be over, but I still wanted to show you what was on my fingertips. My Valentine’s Day Nails included the traditional pink, red, and white, but I threw some black into the mix because I wanted it to have a bit of an anti-Valentine’s Day edge, too. 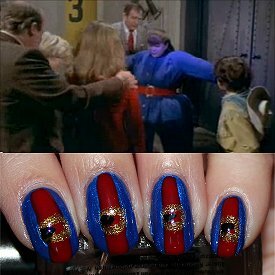 This manicure is also symbolic because I believe everyone should ‘show their stripes’. So, I’m single, and even though I didn’t get any flowers, chocolates, or stuffed toys, I still very much enjoy Valentine’s Day. Last year, I went through an emotional split from a boyfriend a little before Valentine’s Day. From that horrible experience, a profound revelation arose. I realized that I had been in love with the man I thought he was, not the man he actually was. Huge difference! This year, on February 14th, a guy who I just met recently professed his feelings for me! 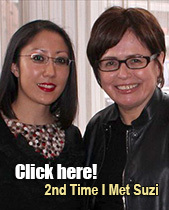 It was very sweet and genuine, so it made me feel like a million bucks! It also took me off-guard, which is a hard thing to do, because I’m pretty good at sensing these kind of things. I’m still single, however. After having my heart stomped on in the past, I’m trying to be more discerning before going steady with anyone. For this reason, I’m casually dating some guys, and I’m honest about it. Then, if I feel a spark with someone who I think is more long-lasting, I will go steady with one. If not, at least I’ve made new friends. In this way, I feel like I can keep my options open and avoid unnecessary heartbreaks from jumping in too soon and too fast. I believe that guys have to earn exclusivity by proving they’re in it for the long haul. Also, time is a great test because it lets you see how they’ll deal with problems that will eventually arise. 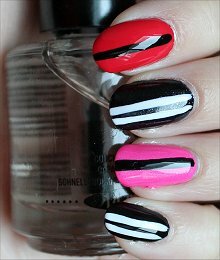 This entry was posted in Nail Art, Nail Polish Swatches & Reviews, Product Reviews and tagged Deborah Lippmann, L.A. 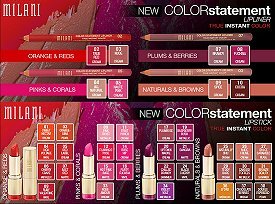 Colors, Milani, Nicole by OPI on February 19, 2013 by Mary S..
Milani is a brand that creates a lot of trendy and affordable cosmetics. I’ve had the pleasure of trying their fun nail polishes. I use their black striper polish in a lot of my nail art, but you’ve also seen me sport their coloured polishes in my posts about Chicken Drumstick Nails and Cookie Monster Nails. But I’ve never tried any of their lip products. 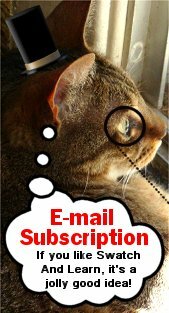 So when Milani’s PR sent me information about their new 2013 promotion, I became as curious as a cat. I’m eager to see these in person because I’d like to experiment with bolder lip colours. From the promo pictures, I’m especially curious about the pinks (because I’ll bet they’ll be fun for the spring) and the purples (because they’re so dramatic). The lipsticks are advertised as being highly pigmented and lightweight, which sound appealing to me. And for those who pay close attention to the ingredients, you’ll notice that they’re also paraben-free. Check out the rest of this post. I’ll share promo photos where you can see each product and the specific colours in greater detail. This entry was posted in Press Releases & Promo Pics and tagged Milani on January 22, 2013 by Mary S.. This year I haven’t had time to do Christmas nail-art tutorials prior to the big day. 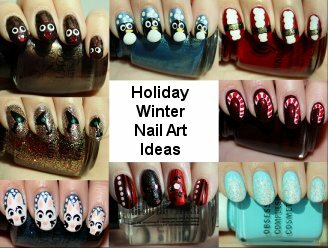 But, since I know that a lot of nailphiles will be busting out the lacquer, I’ve put together this post on Holiday & Winter Nail Art Ideas featuring some looks I’ve done in the past. In this post, I’ve also linked each manicure to its corresponding nail-art tutorial, which features step-by-step written instructions and photos. All, except for one, have tutorials. Plus within some of the posts are links to reviews of the individual nail polishes. This entry was posted in Nail Art, Nail Polish Swatches & Reviews, Product Reviews, Tutorials & Tips and tagged BB Couture, China Glaze, Daniel Stone, L.A. Colors, Milani, Obsessive Compulsive Cosmetics, OPI, Orly, Rimmel on December 22, 2012 by Mary S..
Today’s Red Fiend Nails feature China Glaze Bend Over Backwards (red), Whirled Away (black and white), and Get Carried Away (black, silver, and red), all of which are from the incredible new Cirque du Soleil Collection. You may know that red isn’t my favourite nail colour (although I sometimes crave it), but when it’s combined with black and white, I’m crazy about it! 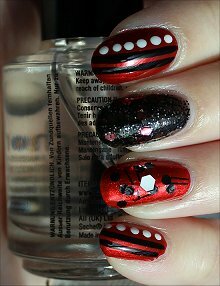 This design includes Bend Over Backwards (red), Whirled Away (black and white), and Get Carried Away (black, silver, and red). Out of the nail-art designs I’ve done so far with the Cirque du Soleil shades, I think this is my favourite because it’s the most cohesive. P.S. At the end of this post, I’ll provide mini reviews for each Cirque du Soleil polish. This entry was posted in Nail Art, Nail Polish Swatches & Reviews, Product Reviews and tagged China Glaze, Daniel Stone, Milani on November 27, 2012 by Mary S..